These quick-to-make jack o’ lantern cups would be perfect for a Halloween party. Just add the kids’ names to the top part of each cup! They’re just the right size for classroom treats, too. 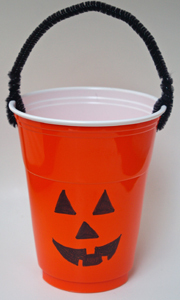 What You Need: orange plastic cup (Solo produces them around Halloween time, and the black cups included in the multipack are perfect for FreePreschoolCrafts.com’s plastic cup spiders. ), black permanent marker, handheld hole punch, black pipe cleaner. How You Make It: Just draw your favorite jack o’ lantern face on your cup! 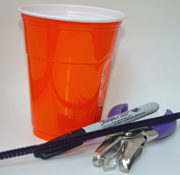 Use hole punch to punch two holes opposite one another near the top of the cup (adult may need to help with this.) Insert about 1 1/2″ of pipe cleaner into each hole and twist to secure. Safety Alert: Permanent markers are not nontoxic, and will mark skin, so be sure to supervise kids closely on this craft. As an alternative, you could cut shapes from black construction paper and adhere them to the cup. This entry was posted on Thursday, September 20th, 2007 at 9:47 am	and is filed under Halloween crafts. You can follow any responses to this entry through the RSS 2.0 feed. Responses are currently closed, but you can trackback from your own site.